Situated on more than three acres of waterfront, this unassuming cottage packs a punch. A true point of land with water on three sides and endless sunset views over Broad Creek is what surrounds the quaint domicile. Recently renovated, this home has been transformed to a light-filled retreat with unobstructed water views, coastal casual decor and updated everything else. Impossible to build this close to the water again, the river room and pool views will draw you in and keep you coming back. Those lucky enough to occupy over the 4th of July week can see fireworks from multiple towns on a clear night. 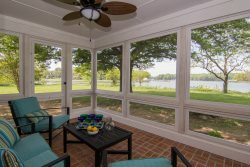 Large expansive grounds will entertain the old fashioned way - fishing, crabbing, kayaking, swimming or letting the cousins play a game of hide and seek instead of sitting in front of the TV. This cottage was reconditioned for family, friends and fun, and is perfectly positioned in between St. Michaels and Easton. Excellent, we literally called on Saturday to book a last minute trip and were happily in the house by noon the next day! They were also able to help us get rental kayaks delivered the next day. Loved the house and property! So happy we were able to bring our dog as well. Only suggestions for the house: more outdoor lighting in the front. There is only one small light at the far end of the porch that works and the lamp post by the drive where you park is missing the light fixture. Very hard to navigate in the dark, especially for older people. Would love more outdoor furniture....there is none on the front porch which is where you want to watch the sun rise or to get out of the afternoon sun. A few more of the Adirondack chairs in the back would be lovely...there was a fight for them every day, especially at sunset. The second floor bathtub has peeling paint which isn't great with little ones, it's the only tub in the house. But such a beautiful property, can't wait to come back! Thanks for a great week! MANAGER RESPONSE: So glad to hear you had a great stay and we will certainly pass along your helpful suggestions to the homeowner. The team at Eastern Shore Vacations is very responsive and attentive. We had a couple of small issues while staying at the rental property, and they were handled immediately. Friendly, professional, quick service. We love Heron Point. This was our second year staying at the property and we enjoy it there so much. Some suggestions: Perhaps the kitchen utensils needs some updating - a nicer can opener for example, better trash can, nicer spatula, wooden spoons, etc. The dock needs some attention and maintenance as boards are popping up. The pool also needs some attention - the plastic sides are popping up. It would be nice if trash were picked up each week - we stayed for two weeks and by the end of our stay the trash cans outside were full and very smelly. For longer stays, trash could be picked up intermittently. Bath mats in the bathrooms would be nice too. Contacted staff several times about maintenance issues at the property and each time the response was appropriate and timely. Beautiful property and home that needs some attention to maintenance prior to guest arrival in order to be truly ready for renting. We had several issues during just one week: no internet or phone service, chair dry rotted and broke when sat in, outside shower came off the hinges when opened, picture not properly secured on wall fell. There were other smaller issues in the home as well (shower drained very slowly, toilet paper holder came off wall, etc.). When I am on vacation I don't want to deal with a homes maintenance issues.